The Canadian housing market just keeps getting hotter. Home prices in the Greater Vancouver area have surged 30% year over year in May, up from 15% at the end of 2015, according to the bank’s June 2016 Financial System Review. 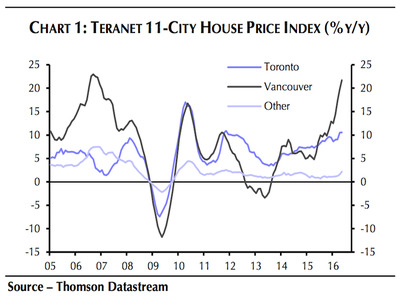 Meanwhile, prices in the Greater Toronto area are growing by 15% YoY, up from 10% half a year earlier. 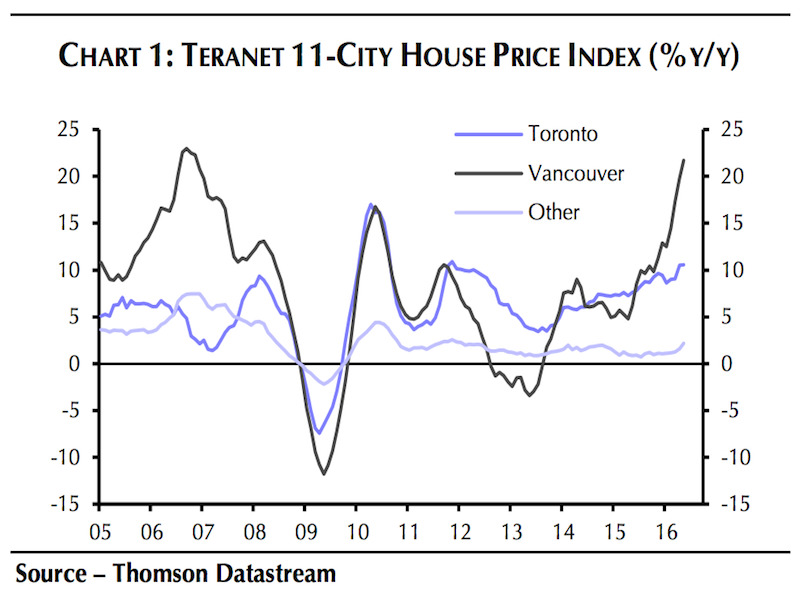 A statement from the Bank of Canada even warned that folks who want to buy homes in Vancouver and/or Toronto should probably recognise that prices are unlikely to further increase dramatically, given economic fundamentals. “Prospective homebuyers and their lenders should not extrapolate recent real estate performance into the future when contemplating a transaction,” BoC governor Stephen Poloz said in the statement. And all of this getting analysts worried. “This is a bubble. A very big bubble. And it is going to end in tears,” wrote Capital Economics’ chief North America economist Paul Ashworth. “The Bank’s claim that the risk of a housing downturn is small because there is little risk of either a spike in the unemployment rate or a jump in long-term interest rate risk premiums is naïve in the extreme,” he added. Plus, he pointed out that the gains in housing prices in these regions now “far exceed” those in the US at the peak of its housing bubble. TD Bank expressed similar concerns, warning that these housing markets are “ripe for a correction” and that “the party will come to an end,” according to CBC News. Of course, as with all bubbles, it’s quite difficult to predict when exactly this will happen. By Ashworth’s own admission, his team first warned about the bubble risk back in early 2011. When prices do begin to fall in Toronto and Vancouver, expectations of further declines could become just as self-fulfilling as the expectations of further price gains now. We have no idea exactly how far prices will fall. But we would stress that the link between price declines and mortgage defaults is not a linear one like the Bank of Canada seems to believe. If prices fall by 20% in the most overvalued markets, pushing recent home buyers deep into negative equity then there is a danger that the price decline / foreclosure rise feedback loop becomes self-perpetuating.